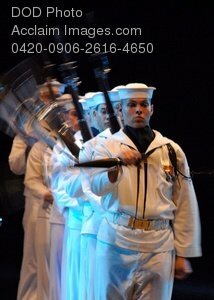 Description: Free, public domain image: Sailors in the Navy Ceremonial Guard Performing a Routine-12th Annual Virginia International Tattoo. NORFOLK, Va. (April 19, 2008) The Navy Ceremonial Guard performs their routine during the 12th Annual Virginia International Tattoo. U.S. Fleet Forces Band and seven other bands from around the globe participated in the 12th Annual Virginia International Tattoo at the Norfolk Scope April 18 - 20. U.S. Navy photo by Mass Communication Specialist Seaman Joshua Adam Nuzzo.